Obesity is a recognized global epidemic. Obese individuals are at increased risk for type 2 diabetes mellitus (T2DM), and both obesity and diabetes are known risk factors for dementia, another global public health issue. 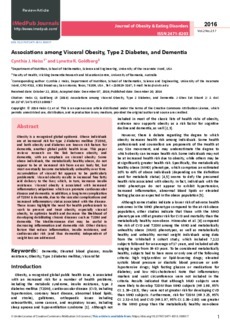 This paper reviews research on the link between obesity, (T2DM), and dementia, with an emphasis on visceral obesity. Some obese individuals, the metabolically healthy obese, do not appear to be at increased risk from excess body fat, but most eventually become metabolically unhealthy over time. Accumulation of visceral fat appears to be particularly problematic. Visceral obesity results in increased free fatty acid delivery to the liver, which, in turn, increases insulin resistance. Visceral obesity is associated with increased inflammatory adipokines which can promote cardiovascular disease and dementia. In addition, a long term complication of T2DM is dementia, due to the vascular complications and increased inflammatory status associated with the disease. These issues highlight the need for health professionals to work to prevent and treat obesity, especially visceral obesity, to optimize health and decrease the likelihood of developing debilitating chronic diseases such as T2DM and dementia. The Mediterranean diet may be useful in decreasing inflammation and dementia risk. Other dietary factors that reduce inflammation, insulin resistance, and cardiovascular risk (and thus dementia) independent of weight loss are addressed.